In wunderschöner Reinheit manifestiert hier auf dem Thangka Dorje Chang. 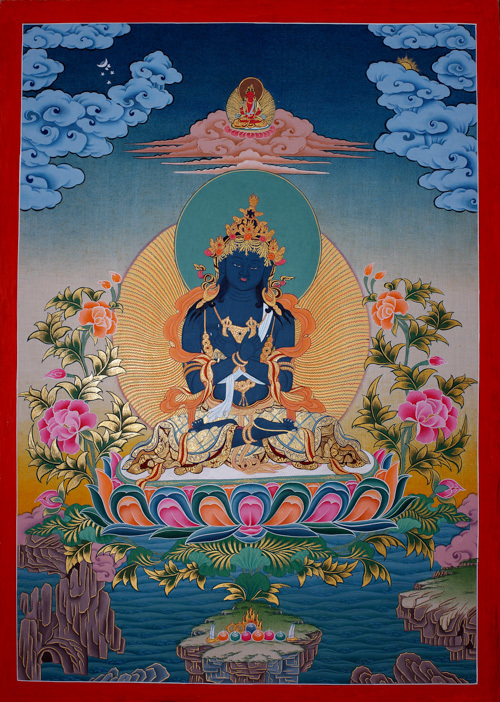 Die Thangka-Darstellung des Vajradhara, des "Halters des Vajra" oder "Diamanthalter", ist in dieser Klarheit hervorragend zur Meditation geeignet. Thangka-Malerei unter reichhaltiger Verwendung echten Goldes. In beautifully purity appears on this thangka the Adibuddha Dorje Chang. The thangka representation of the Vajradhara is very clear. The "Diamond-holder ("Holder of the Vajra") on this thangka therefore is suitable for the meditation. The thangka-painter has used real gold.